Hi friends! During September, the Eileen Hull Inspiration Team is sharing Fall-o-Ween projects. It's such a beautiful time of the year. Don't miss all the inspiration posted by the team this month. I have been wanting to make a wrapped journal for myself, after having given away all the wrapped journals that I have made so far. When we visited an historical theme market recently, I came across a pile of scrap leather. 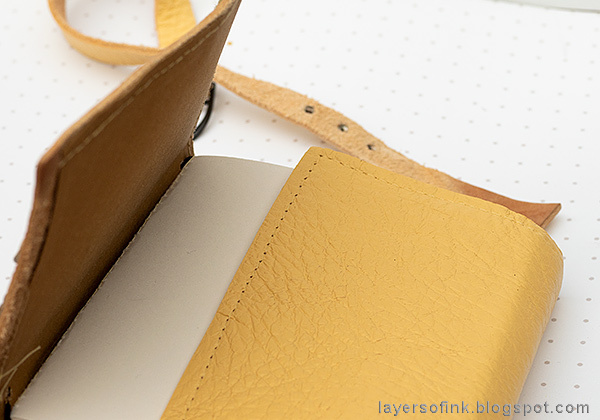 After having looked through the entire pile to find a piece that was the right size for a wrapped journal, I found this pretty yellow/beige piece.This is a quick and easy project and if you can also use faux leather, or mat board covered with patterned paper or cardstock. 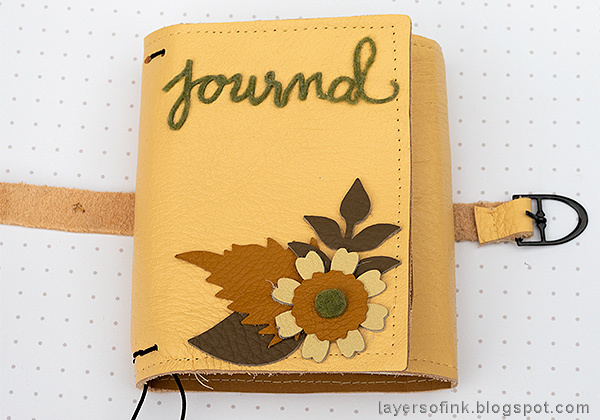 The finished journal measures 4.7 x 5.1 in folded. 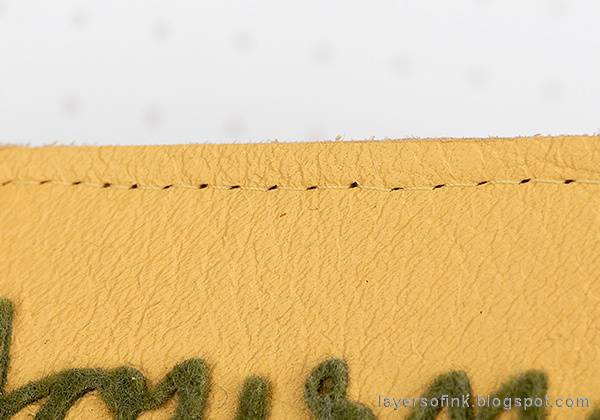 I started by test cutting just a tiny piece of leather, to make sure that the scorelines of the Wrapped Journal die wouldn't cut through the leather. I only had enough leather for one cover and I didn't want to mess it up. I die cut it with the outside up, so that the scorelines are actually on the inside. If you use mat board, die cut it the other way around. I used Eileen's Heart & Soul Flower and Spring Leaves Bigz dies to die cut flowers and leaves from various tiny pieces of leather which I have had in my stash for years. When typing up this post, I saw that the flower die that I used is retired, but Eileen has many flower dies that you can use instead. 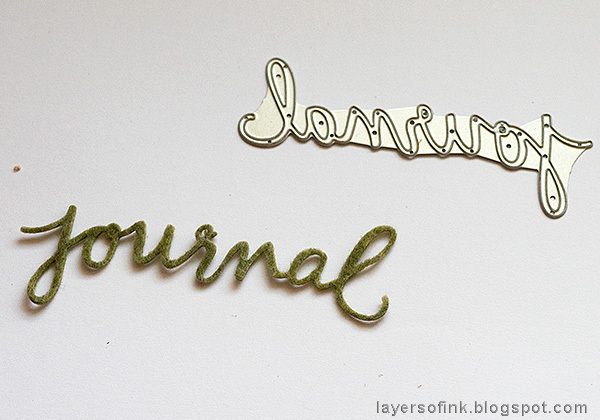 I also die cut a title using the Journaling Words set from thick felt. The signatures are very easy to do. I want this to be a sketch/notebook, so I used one of my favorite sketch papers. Mine are about 7.7 x 4.7 in (19.5 x 12 cm) and fold in half. Arrange in four signatures of about 6 papers each. Stitch down the center. You can also leave the papers lose or use staples. I couldn't quite decide what do do on the inside. I wanted the covers to be flexible, but I think using only the leather, would have made it too soft, especially at the spine. Instead I used the Wrapped Journal die to die cut an inner cover from Sizzix Paper Leather, which is very flexible, but still strong. 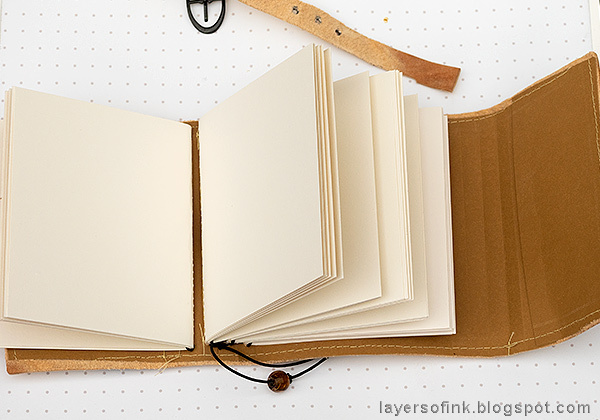 The paper leather isn't big enough for the journal, so you'll have do die cut two pieces. 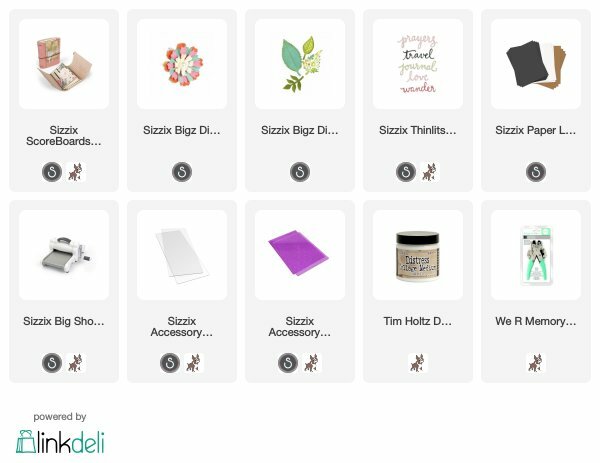 You could also use cardstock. 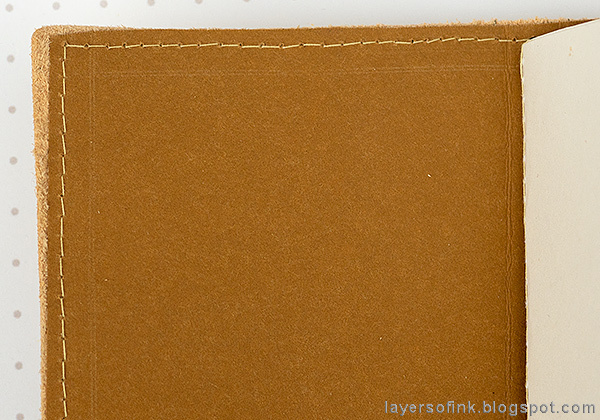 I stitched the paper leather to the cover and got a border at the same time. My sewing isn't perfect, but that isn't what I was aiming for. I should have adhered the paper leather better to the inside before sewing, because I had to trim off some of the edges since it shifted a little. 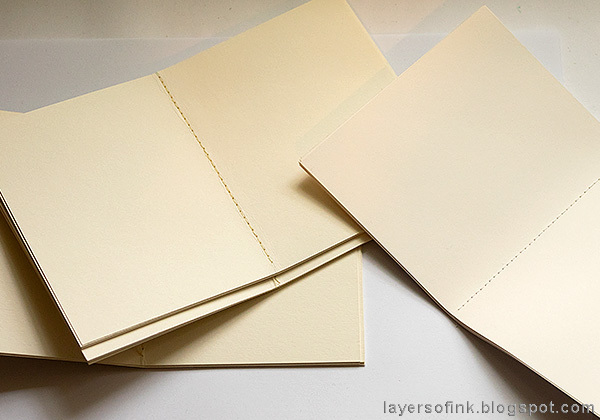 You can bind the journal in different ways - check the die packaging for ideas. I used a piece of black elastic string and did a simple bind. 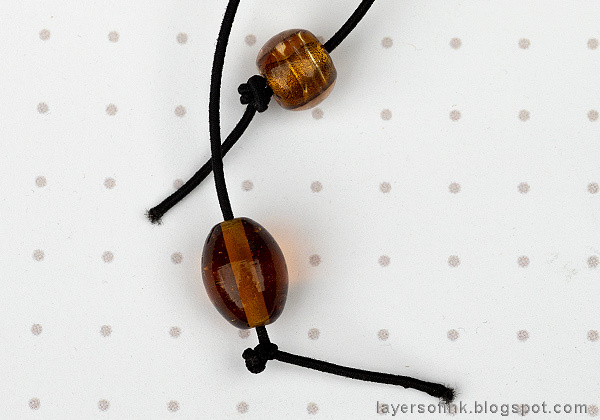 Two glass beads were tied to the end of the strings. Simply slip the signatures under the elastic bands. I like that I can take signatures out and also replace them when they are full. It makes the journal last a lot longer too. 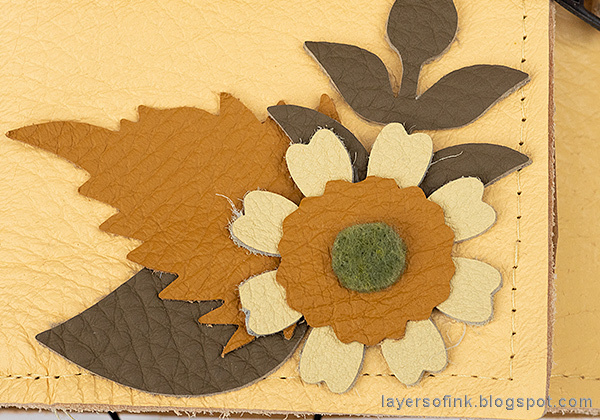 Layer the leather leaves and flower on the cover and place a small felt circle in the center. Glue the felt word to the cover. 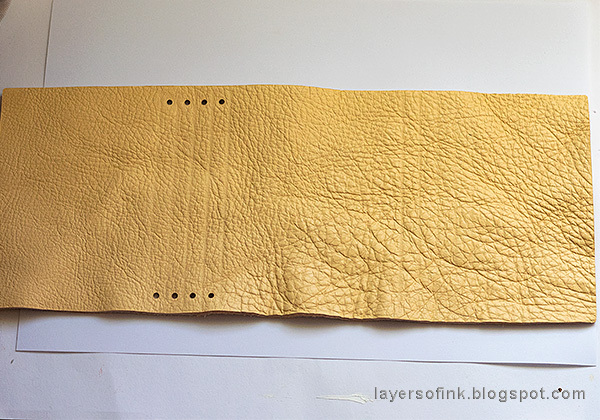 To tie my journal, I made a super simple little belt, using a left over piece of leather, left on the one side when die cutting the journal. I found a buckle in my stash, made three holes and set eyelets in them. 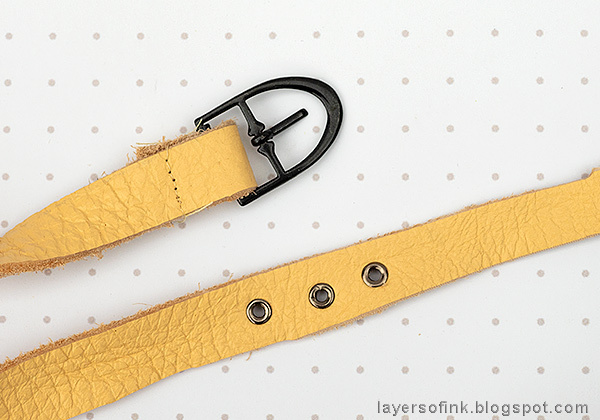 You can do a neater belt if you want to. I didn't even make sure it was the same width all the way. 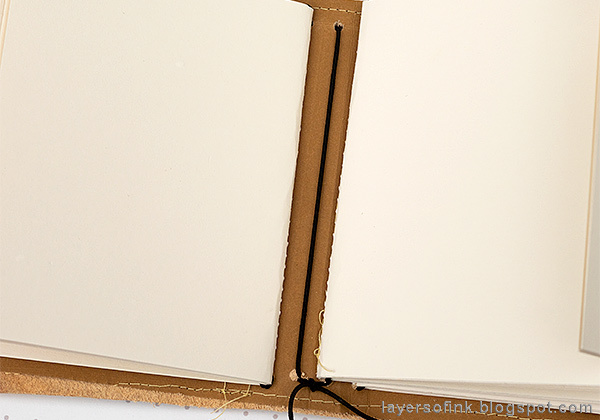 The wrapped journal can be wrapped in two ways. Here I folded in the right hand flap first. You can do it the other way around too. Then just add the simple belt, or tie with a piece of ribbon or string. 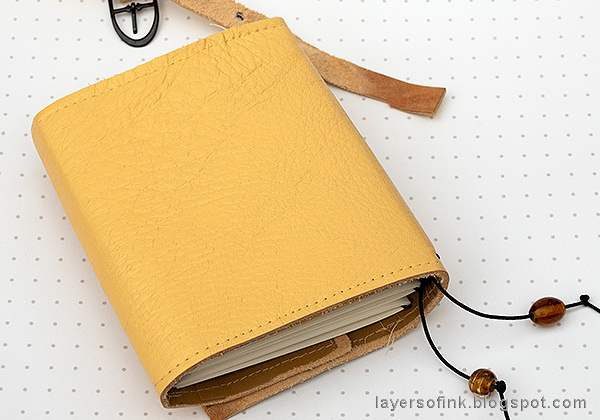 The wrapped journal has a very nice and chunky feel to it and I am happy with how my leather journal turned out. It would make a great gift too, but I am keeping this one for myself, since I have given away my previous wrapped journals. If you want more wrapped journal inspiration and tutorials, you can check them out: Wrapped Journal and Blue Textured Wrapped Journal. Here's a look on the inside. You can also add pockets to the inside covers, if you want to. I didn't add any details to the back, but you can of course decorate it too. Thank you Eileen!! 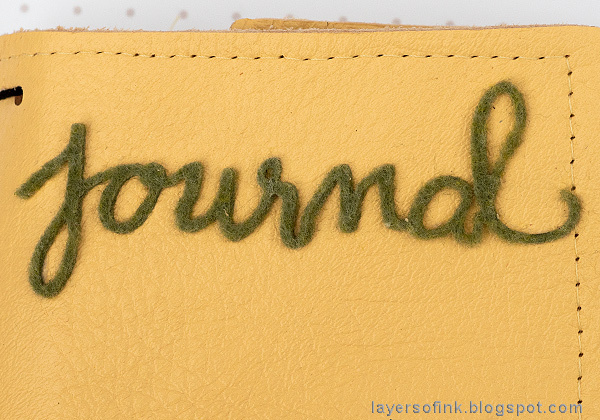 Anton actually wanted the journal, but I am making him one in felt instead. one of my favorites for the year!!! 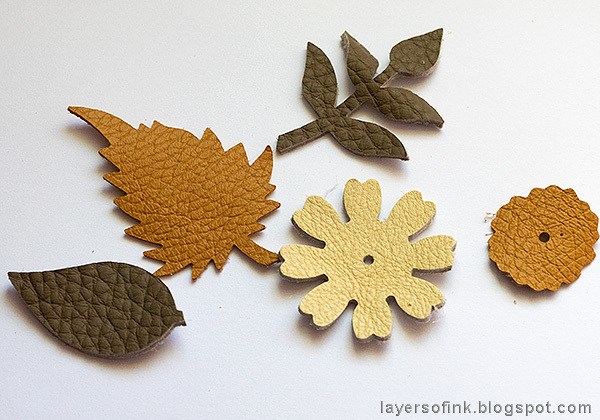 I am in love with the mustard leather and the leather leaves!!! I love the mustard too. Great post with some excellent tips, thank you. You did make me smile, I too, have given away all of my wrapped journals and have just made myself a red leather one - I have even written in it so that I won't give it away! 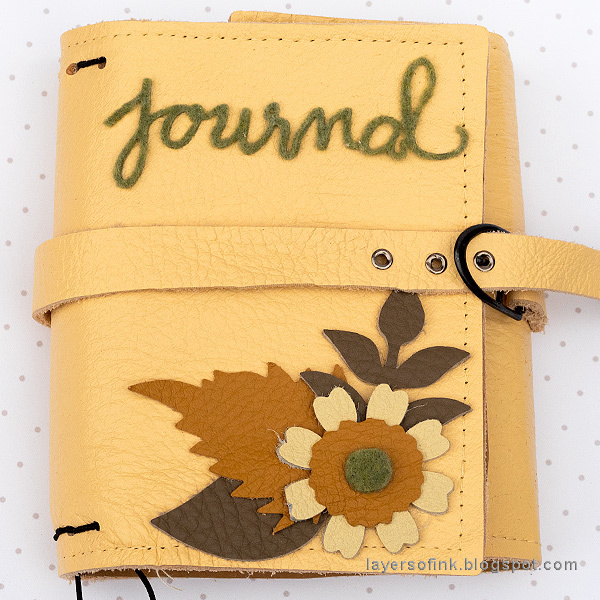 Your journal cover is so beautiful! The leather cover must feel amazing to touch. 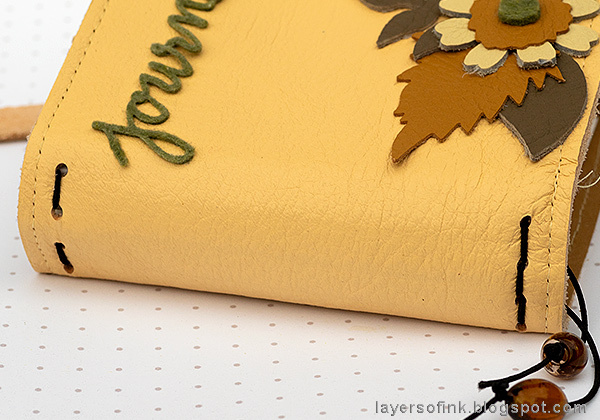 The leather die cut out so nicely for the flowers. I would never even have thought of trying to diecut leather! Hmmm...another source could be second hand stores where they sometimes sell damaged coats and clothing at very reduced prices. 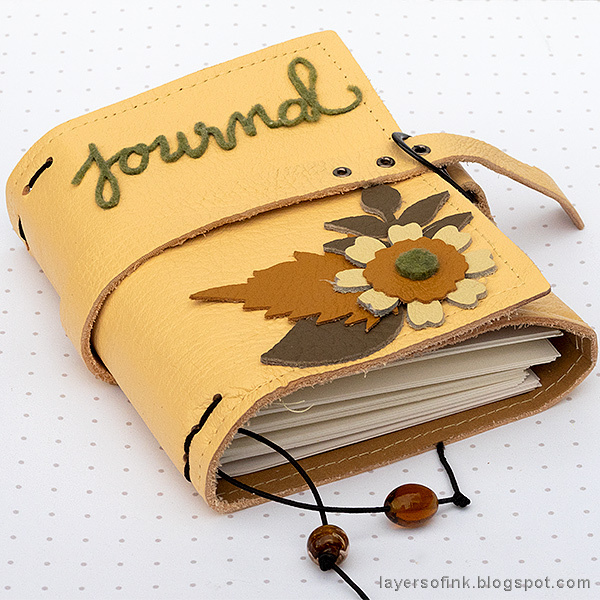 What a wonderful journal! Love the color and beautiful texture of that real leather! I also love how you arranged your floral bit using flowers and leaves - what a nice place to keep your sketches!